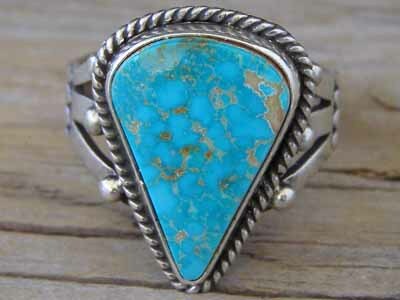 This is a classic design Navajo ring set with a blue teardrop-shaped stone of natural, untreated Royston turquoise from Nevada. The stone is set in a smooth bezel wrapped with twist wire. The shank is split into three narrower bands before attaching to the ring back. Raindrops accent the split shank at its attachment points to the ring back. Hallmarked L. Ganado and stamped Sterling on the ring back.